The Developer Editions of the Moto X are now available for both Verizon and GSM networks. Priced at $649, these two devices feature a custom look with black face and white back, along with the words “DEVELOPER EDITION” so that you don’t forget how much of a tinkering boss you are. Should you choose the dev-style, you’ll also get 32GB of storage and an unlockable bootloader. Motorola points out that with a Developer Edition you can “change settings, flash a new kernel, and pretty much gain superpowers,” which of course also means that you will void your warranty in a hurry. From a specs standpoint, outside of the 32GB of storage, these Developer Editions remain identical to their carrier-locked counterparts. The Verizon version runs on LTE band 13, but also has global roaming capabilities that will land it on HSPA+ networks. The GSM version runs on LTE bands 2, 4, and 17 (700/AWS/1900MHz), so you should see LTE on T-Mobile and AT&T. The Verizon version is currently in stock. The GSM version is showing as “out of stock” at the moment. We should probably point out that the 32GB version from AT&T runs $629, so yes, you are paying a premium just to have an unlockable bootloader and two-toned color job. Worth it? You decide. 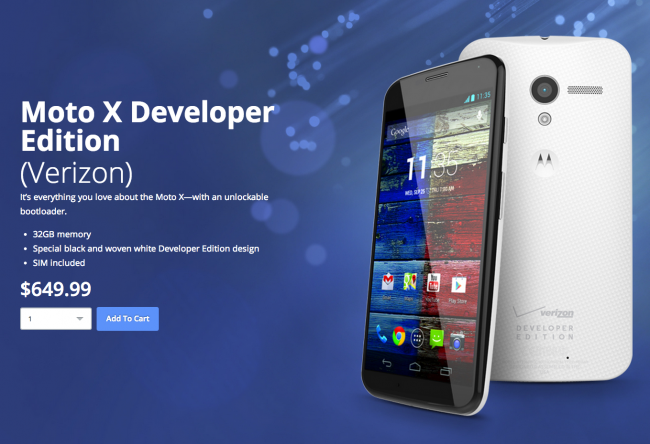 Update: The DROID MAXX Developer Edition is available as well.